Canadian winters: some people love them, some people hate them – but there’s more to them ice, sleet, and snow. Whether it’s curling up by a fire, overlooking a frozen lake, or hitting the slopes atop a snow coverage village; there’s magic to be found just about everywhere. From festivals and 5-star hotels, to spas and resorts – there’s an abundance of opportunity for rest, relaxation, and adventure just hours outside of the GTA. Check out some of our favourite destinations below and don’t forget to pack your parka! Travel Time: approximately 4 hrs drive from Toronto. There’s no better place to celebrate a Canadian winter than in the nation’s Capital – especially during one of Canada’s largest winter festivals. Every February, Winterlude transforms Ottawa-Gatineau into a true winter wonderland, drawing in over half a million visitors. Skate the world’s largest ice rink along the Rideau Canal, explore Snowflake Kingdom or catch a fantastic ice sculpture show. There are events and activities for all ages and interests. Lose yourself in this giant winter playground! Travel time: approximately 2hrs drive from Toronto. Eat. Sleep. Ski. Shop. Relax. Blue Mountain Resort is a one-stop shop for your winter getaway needs. Skiers and riders can enjoy 42 trails across 364 acres of skiable terrain both day and night, while foodies can taste their way through unique restaurants in the Village. With a variety of family-friendly attractions from outdoor pools and hot tubs to artisan shops and skating rinks, there’s something to see and do for all ages. And if you’re craving a little rest and relaxation – they have that covered to. Just hop on over to the beautiful indoor/outdoor Scandinave spa for a massage, yoga, or hot bath. Did we mention they have lodging too? Hotels, private cabins… Blue Mountain Resort has truly thought of it all. Travel time: approximately 3 hrs drive from Toronto. Do you love winter and embrace the great outdoors? If so, than Deerhurst Resort is the ultimate hotspot for outdoor winter fun. Not only is use of snowshoes, Nordic skis and skates all included in your resort fee – but there is so much to see and do both on the resort and a few minutes’ drive off-site. Saddle up for a leisurely ride through snowy woods, cozy up near the campfire, or explore a Muskoka winter wonderland from a snowmobile. Only 10 minutes down the road is the charming Arrowhead Provincial Park, home to a 1.3 km skating trail, snow tubing and more. Love the idea of winter in Muskoka but want to stay cozy inside? They have that covered too. 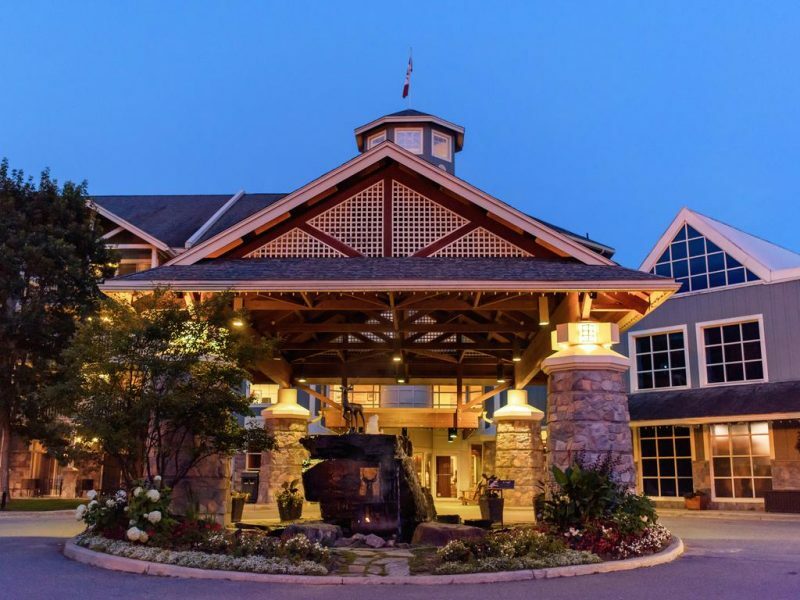 From an indoor pool and hot tub, to spa services and delicious restaurants, there really is something for everyone at Deerhurst! If you’re looking to get warm and stay warm, Langdon Hall is the perfect destination for you. Experience luxury and elegance with 60 luxurious guest suites, full service spa, outdoor swimming pool, and a 5-diamond award winning restaurant. It’s warm, cozy and wooded – with wood burning fire places in guest suites and beautiful trees lining the 30-acre property. Their spa will also keep you warm with a hot stone massage, whirlpool, steam room, and sauna. This destination is perfect for those who love winter for its crisp, picturesque qualities, but much prefer to stay pampered and relaxed indoors. 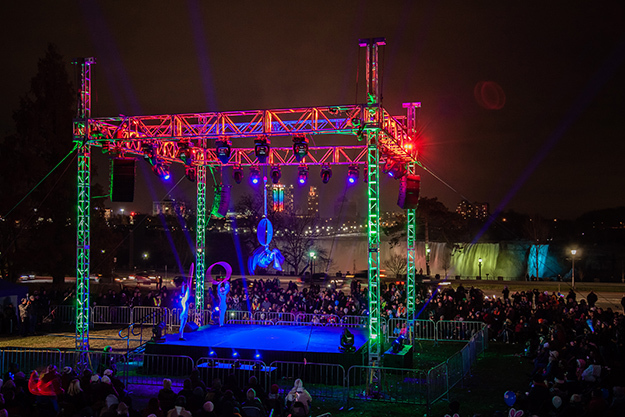 One of the most enchanting of the Niagara attractions is the Niagara Falls Winter Festival of Lights hosted by the Ontario Power Generation. Tour an 8 km route illuminated with over 2 million lights through the beautiful landscapes of the Niagara Parks, Dufferin Islands and surrounding tourist districts. You’ve never seen anything quite like this! But the fun doesn’t stop there. Plan your visit around the weekly fireworks show, Niagara Falls New Years Eve Concert or the Niagara Icewine Festival. Visit for a day or a weekend, staying at one of the many hotels and visiting many of the other attractions (including the signature Niagara Falls). There’s no better way to see a winter wonderland than aboard a dogsled. 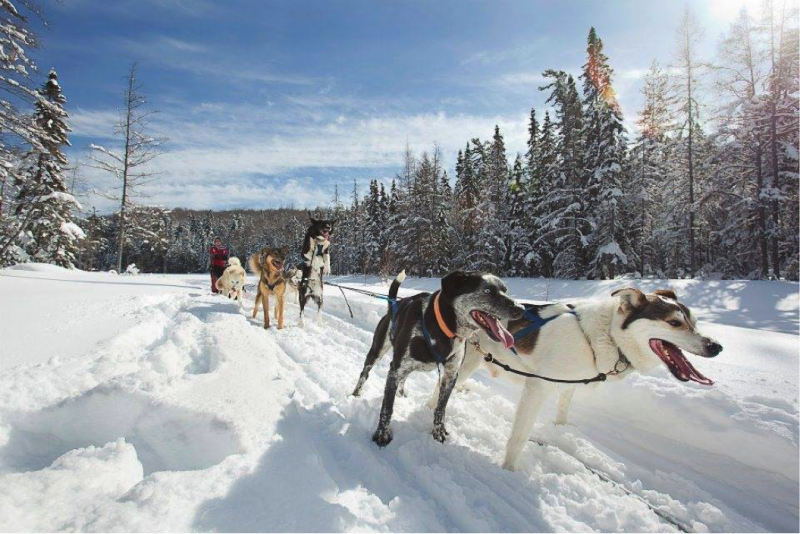 Experience spectacular winter wilderness in a unique way as you relax and enjoy the scenery while being led by a team of passionate dogs. There are many excellent dogsledding outfitters to choose from in Ontario. You can choose from trips lasting from one hour to days – and you can even learn the basics to leading these incredible animals yourself! A trip to a near-by kennel for a weekend of dogsledding can make a fantastic winter getaway! Up for the adventure? Check out some of the best dogsledding tours available in Ontario. This article is sponsored by travel blog BorderTribe.